Michael is known not only for his outstanding communication skills, unparalleled negotiating abilities and creative marketing approaches but for his total dedication to his clients. In his eleven year career with Koenig & Strey Real Living, he has built a 100% referral-based business while forging long-lasting personal connections as he helps his clients buy and sell throughout Chicago and the suburbs. With multiple awards for sales performance and professional service, Michael was most recently honored by “Chicago Agent Magazine” which has featured him in “Who’s Who in Chicago Real Estate” for 2011 and 2012. Michael also received a Platinum Level Award from the Chicago Association of Realtors for more than $31 million in residential sales in 2011 and was named one of the Top 20 real estate agents in Cook County in 2011. Michael has also earned the industry’s prestigious Five Star Award for the past two years. This award is presented to an elite group of real estate agents who provide an exceptional quality of customer service and overall client satisfaction. The award is given to less than 2% of all real estate agents in Chicago. 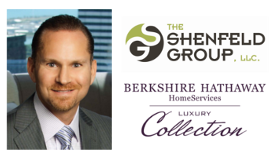 He also is a recipient of a Koenig & Strey Real Living Diamond Elite Premier Service Award for having one of the highest levels of satisfied clients among Koenig & Strey agents. Michael founded The Shenfeld Group LLC in 2002 to bring additional support to his clients. With over 50 years of combined real estate experience, The Shenfeld Group gives clients the added value of access to multiple agents who work on their behalf. The Group offers experience in all areas of Chicago and its surrounding suburbs. Their team approach insures total accessibility for team clients. The Shenfeld group is consistently ranked among the Top 30 Real Estate Teams nationally. Born and raised on the North Shore, Michael has lived in Chicago since 1995. He received a full scholarship from Eastman Kodak Company, graduating first in his class in Commercial Photography. For seven years, Michael owned and operated a successful commercial photography studio working with local and national accounts. When real estate beckoned, he brought his well-developed creative skills as well as his experience in building successful client relationships to his chosen career as a real estate consultant. Michael’s free time is devoted to family activities with his wife, Lori, and daughters, Isabelle and Addison. Photography continues to be a favorite leisure pursuit as is an occasional round of golf and even a ride on his Harley.